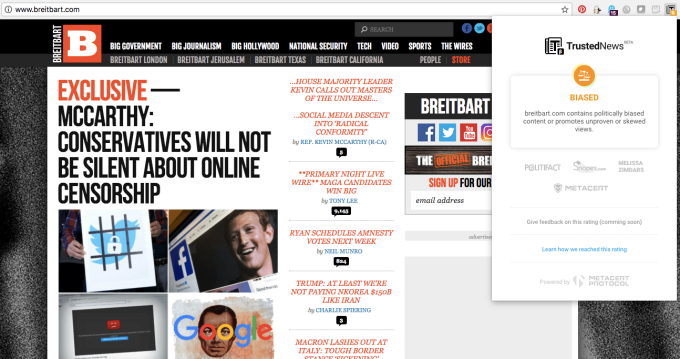 Eyeo, the makers of Adblock Plus, have launched a new browser extension called Trusted News - basically working like Adblock for fake news content. Remember Adblock? That Chrome extension working silently in the background to make your internet experience slightly tolerable? Well, imagine this same functionality adapted to tackle the problem of questionable news sources. That is what this extension does - currently in its beta phase. It’s designed to help internet user spot fake news sources while keeping your web browsing history completely private. Once you install the extension, you will see the Trusted News icon and either a green check-mark or red flag notification dot over the top, at any time you’re on a news site. I don’t need to explain that the check-mark indicates a trustworthy source. The red flag can mean any of a few flagged issues, which can be seen upon clicking - ranging from the source being biased, untrustworthy, satire or clickbait, to being malicious or just unknown to the service. How does it decide what is real or fake news? This is the make-or-break of any software that analyses the legitimacy of content on the internet. If the algorithm judging content is inherently bias, then we’re going to have a problem. Luckily, Eyeo have thought about this. To create an unbiased Trusted News service, the MetaCert Protocol aggregated trust and reputation data from politically independent fact-checking organizations and news sources worldwide, including PolitiFact, Snopes, Wikipedia, and Zimdars’ List. So, a ranked database based on the world’s best known independent fact-checkers, paired with community reviews for a constantly updated system. Sounds good, right? Will it help fix the fake news problem in the future? The answer to this question will always be subjective to some, given the somewhat unfortunate situation we are in where people willingly remain blind to straight-laced journalism in favour of the more grandstanding sites of click baiting glory. However, given the level of attention given to ensuring the content aggregation is as unbiased as possible, a tool like this will definitely help educate future internet users and ensure they are aware of potential disinformation. The fundamentals of the system do raise potential questions about the future trustworthiness of the extension itself. Crowdsourced engagement and community submissions are actively encouraged. What if that community sending these reviews were submitting with their own bias? This push for participation from the wider internet is an admirable goal, but is also one that (much like any other internet product) can go very very wrong. So I implore you, dear reader, to download the extension. But for the love of God, don’t misuse it.